I had promised more to my 'Return to Fort' story. I left Rahmaniya stuffed, my stomach bursting beyond capacity. My shirt buttons were strained. My plate unfinished. I was satiated. I stepped out and took photos of the street outside Rahmaniya. 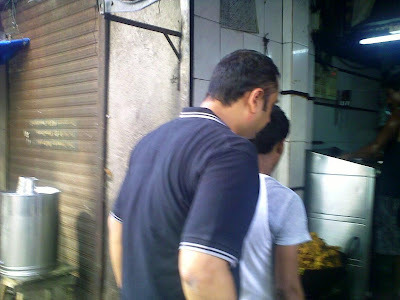 That's when I spotted a little, nameless, 'bhajiya' stall opposite. 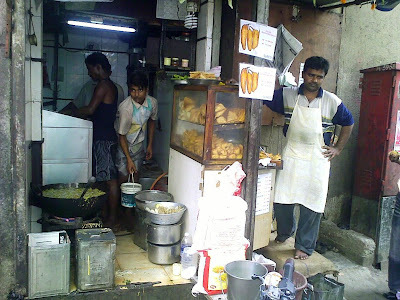 Bhajiyas are, of course, the ultimate Mumbai street snack. Batter coated vegetables, deep fried in tonnes of oil. Then re-fried as I found out. The king of which is the vada pao. Mumbai's biggest icon till Sachin Tendulkar strode down the pitch. Well, the shop was not entirely 'nameless'. Posters of fried chillies, a speciality of Gujarat's Bhavnagar apparently, also screamed out the name 'Suresh'. The elusive owner of the shop. My attention was drawn to the wok. The bubbling and stormy oil into which the street chef deftly popped in batter coated balls. I was transfixed by sight of the helpless little yellow lumps hitting the raging oil. A scene scripted by Dante. Promising deep fried bliss. Provided you were willing to make a suicide pact with food. But then who can think of arteries at a time like this? The man making the bhajiyas was lost in his work. One wrong step could lead to scalded, disfigured arms. 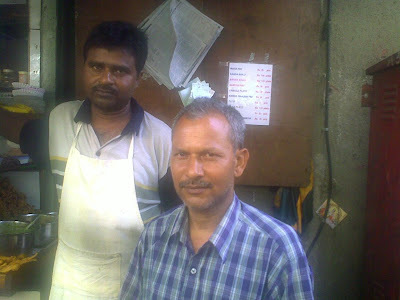 But his cohorts, Gautam manning the stall, and Muzaffar, standing and inspecting the process, were amused by my interest. Gautam told me that the advertised fried chillies were not piping hot. Nor were the other bhajiyas. He asked me to wait for the bhaajis being fried. These were palak or spinach bhajiyas. Spinach? I could understand waiting for potato or alu bhajiya or batata vadas. Who would wait for spinach? Gautam convinced me to. I licked my chops as the cook took the bhajiyas out of the oil. That's when Muzzafar told me that I'd need to be patient. The job was half done. 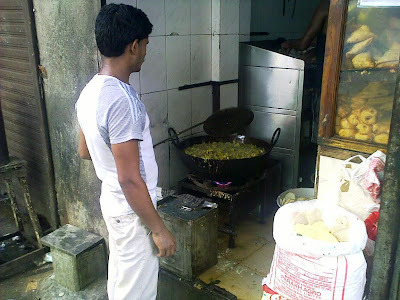 He explained that you have to let the bhajiyas cool and then dunk them back in the oil. Otherwise they turn soft and don't form properly. Something my Mom told mes about the way she makes chili chicken recently. Still, imagine a doctor delivering a baby. The baby comes out, sees the world, prepares to cry out in triumph... and is shoved back in. The sort of thing that would lead to Woody Allen like neurosis when the baby finally comes out. I had to get back to work. Muzaffar coaxed me to stay back. "Five minutes more". The pakoras were finally ready. Gautam plated them for me after he ascertained that I didn't want pao, the local bread buns. I explained that I was actually full and just wanted to taste a few bhajiyas. Muzaffar proudly gave my three chutneys - sweets, green (coriander & green chilly paste) and a red powder which they give with vada pao. The red powder was a mix of dry red chilies, garlic and peanuts. Typical Marathi masala he explained. I asked for a fried green chili to go with this. My camera had run out of battery and I got Muzaffar to click me with my E71. Unfortunately I had to use the mobile to photograph the bhajiyas too. 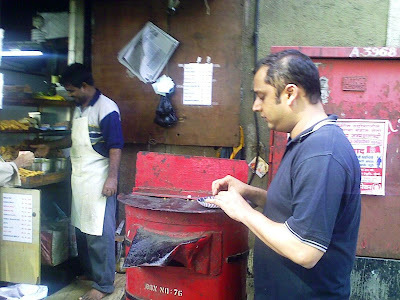 I balanced the paper plate on a bright red box letter box as I clicked and ate. Post box. Remember those? Well let me try to bring alive the bhajiyas to you in the absence of good photographs. Pieces of onion, spinach and green chillies coated in gram flour (besan). Sounds rustic and uncomplicated? Well imagine seeing it come out of the pan and served to you straight. You gingerly touch it with your fingers. Expecting to be singed. You slowly lift it and take a tentative bite. Your first reaction is a sense of relief, finding out that it has cooled enough not to scald your mouth. Fears conquered, you take your first bite. The reassuring crunch of deep fried perfection. Then the bhajiya slowly gives in. From firm crunch straight to pliant joyous mastication. No stickiness or chewiness in between. The first taste is that of the salt of the batter. Just right. Then the polite and restrained bitterness of spinach nudges you. You begin to roll the mouthful when the fiery darts of the green chilies hit you. Fireworks that bring the curtains down on your first glorious bite of the palak bhajiya. You start off on your next bite, stuffed stomach be damned. I took out my wallet to pay. Muzaffar and Gautam wouldn't have any of that. They sent me back to work with smiling faces. I was back where I belonged. At least for another month. And, in case you were wondering, I didn't get a single burp despite the masala laden food of Rahmaniya and the sizzling fare of Suresh's. This was good, honest food. the narration was excellent..and pictures too good, loved the post box picture,,,overall very clear and cool picture of fritters..looks tempting!! 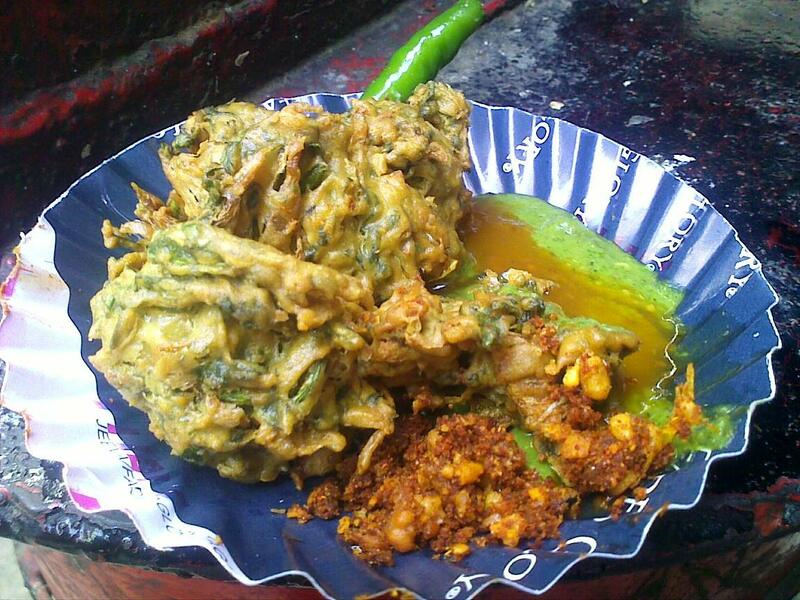 palak bhajia's are quite popular in u.p. bihar households......to see them served with the red powder that you mentioned is quite interesting and must definitely be delicious! but nothing can compare with Bengal's aaloo chop!